Montreal has had it’s share of public tragedies. Stephanie Lanthier writes, “On December 6, 1989, a young man, Marc Lépine, burst into a class at Montréal’s École Polytechnique armed with an automatic weapon. He separated the male and female students and fired point blank on the latter screaming, “You are all feminists”. Fourteen young women were murdered and 13 other people wounded. Lépine then turned his gun on himself and committed suicide. Later, a list of eminent women was found whom he had identified as “feminists to slaughter”. Then at Dawson College, on September 13, 2006 Kimveer Gill was the Canadian perpetrator of the shootings in Westmount, Quebec. He killed one student and wounded nineteen others before committing suicide. Kimveer Gill had a fascination with 9/11 conspiracy theories, the war in Iraq, and the 1999 Columbine High School massacre. The head of the Trauma Center during both of these tragedies was Dr. David Mulder at the Montreal General Hospital. Dr. Mulder in both instances was the best of the best saving as many lives as possible with his team of dedicated surgeons and nurses. My youngest son was one floor above the Dawson College shootings. He managed to escape down a stairwell as Gill started shooting below. My wife and I spent frantic moments in total panic trying to comprehend this unfolding nightmare, then to wait in desperation as my son’s text message to us ended mid sentence abruptly. I had a personal reaction to the whole incident not the usual bystander type of role. I cried for months for the innocent victims as if they were my children. For me Dr Mulder is a saint. 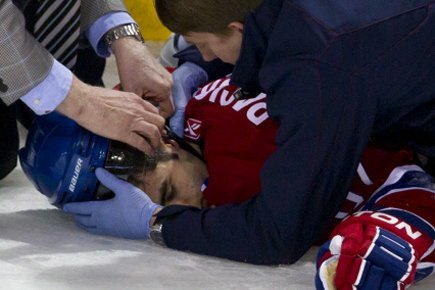 Dr. David Mulder was at Max Pacioretty’s side after the devastating hit by Boston Bruin’s defenseman Zedno Chara. As can be seen in the picture the hit took Pacioretty off his feet as his head contacted the stanchion, fracturing one of Pacioretty’s vertebrae at the impact ferocity. Notice the slight braking spray on Chara’s left foot plus the placement of his left hand just above Paciorrety’s head as the hand guides along the glass. Chara is facing forward as if the collision with the stancheon is not meant to be. What was also mentioned during the conference was the fact that previous athletes without any symptoms after their university careers decades after showed disturbing changes within their brains that they were not aware of. A neuroscience student researcher, Ian Maher on the 2012 Brain Awareness Montreal web site who was at the Pacioretty hit March 2011 Montreal/Boston game wrote, “A concussion is a form of traumatic brain injury, in which a sudden impact causes the brain to compress against the inside of the skull, resulting in a temporary loss of brain function. The majority of concussions do not result in loss of consciousness. Roughly 1% percent of the population will suffer from a concussion at some point, although this statistic is likely an underrepresentation of the true prevalence. We used to view concussions as relatively minor events, but some disturbing recent studies have shown that they can have serious consequences. Common side effects of a concussion are headache, nausea, loss of motor coordination, and sensory dysfunction. These usually dissipate without requiring treatment acutely after the injury. However, with post-concussion syndrome, symptoms may not disappear for months or years, or even at all, and there is currently no treatment except rest. We are also learning a rapidly increasing amount about the effects of concussion on emotional and cognitive function. Recent studies in National Football League players have shown an association between concussion and depression, as well as memory deficits and general cognitive impairment. Tragically, traumatic sports injuries have even been linked with suicide. These effects have been attributed to chronic traumatic encephalopathy, a degenerative condition in which multiple head injuries lead to aggregate damage to the brain; boxers that are termed ‘punchy’ suffer from one form of CTE. This is what legondary Red Fisher of the Montreal Gazette wrote about Dr Mulder. “The titles are there, mirroring in part the accomplishments of a person’s dedication to the care of the injured and the sick. David S. Mulder: two terms as surgeon-in-chief at the Montreal General Hospital; Mulder: a prominent player in the development of a trauma-care system for the province of Quebec; Mulder: medical director of the McGill Sports Medicine Centre. 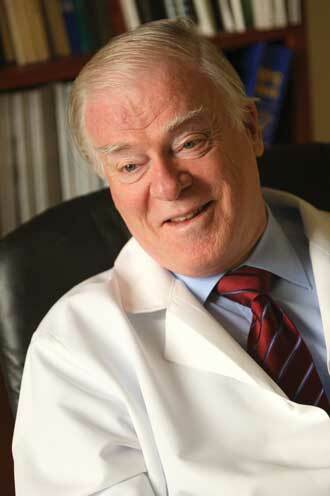 He has been a significant contributor as the leader of many professional societies, including service as president of the American Association for the Surgery of Trauma, Central Surgical Association, Canadian Association of Clinical Surgeons, International Association for the Surgery of Trauma and Surgical Intensive Care, Canadian Society of Cardiovascular and Thoracic Sureons and the Canadian Association of Surgical Chairmen. 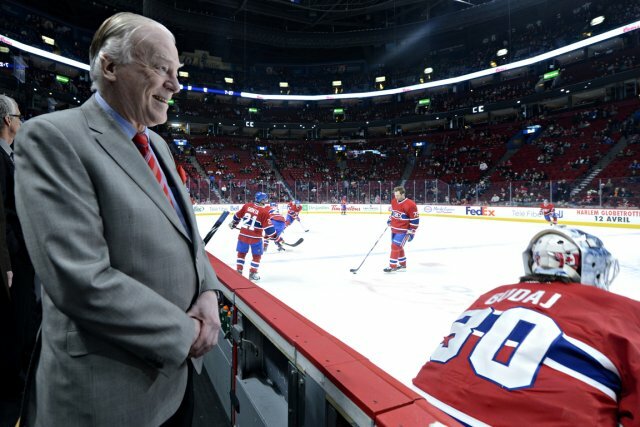 The list goes on and on, so why is this soft-spoken, special person who late this afternoon is being honoured by the Montreal General Hospital with the Dr. David S. Mulder Chair in Trauma Care, still looking after men who play a boys’ game as the team physician of the Montreal Canadiens? The Game makes him do it, he says. “I played hockey in a little farm town in Saskatchewan … in Eston,” Mulder said. “It’s a grain farming town of 1,500 people. My father was a farmer. He immigrated from Holland. He played soccer. We didn’t even know what soccer was in this little town, but everybody played hockey, and I got into playing at all levels: atom, peewee … all through the ranks. “I was going to be the next Gordie Howe,” he added with a tight, little smile. Medicine was the big winner. “There were three of us, and we would form a schedule that didn’t conflict with our own schedule. The hockey was fantastic … the days of Gilbert Perreault, Rejean Houle and Marc Tardif. It taught me a little bit about discipline and about who’s playing on the team, which is what I do now in the operating room. “I play on a team. I learned about team sports and the value of working with a team. I think from that point of view, it was an enormous help. I think the discipline of working in a sport helps you in whatever you do. Claude Ruel was another member of the Canadiens organization Dr. Mulder got to know and like. One day, he accompanied Ruel to Burlington, Vt., to scout a college game. Ruel was there to watch a prospect named John LeClair. But for a shiny Stanley Cup ring on your finger what is the sacrifice for many concussions? Here in the words of Los Angeles Kings defenseman, are the reflections from Willie Mitchell during an interview concerning his many recoveries from concussions written by Jesse Spector on aol.sportingnews.com June 1, 2012. “Oh, he got his bell rung.” Anytime you feel dizzy, headache, got your bell rung, that’s a concussion. That’s what it is. We downplay it instead of actually embracing it for what it is and giving it significance. The brain’s everything, right? You don’t have that, you don’t have life, you don’t have happiness, you don’t have your day-to-day. There’s not much good in life without it. The first two were similar—four-or-five week episodes, where I started to feel better after about three weeks. The last one was more complex. They’re different, and I try to explain that to guys, how their different. Eight months, a year, it becomes chronic. It becomes like almost you’re terminally ill. You have an illness that’s not going away, because every day you wake up, it’s the same thing. It gives you a little snippet of people who live that in daily life. It becomes not only a physical injury, but emotional, as well. You’re dealing with something that you think is never gonna get better, and you’re turning everywhere to get help, saying “who can help me?” No one can. There’s no answer for it. I’d try anything to try to get healthy. Hyperbaric chamber, I was doing that. Craniosacral work. I did alternative medicine, where I tried neural therapy. You name it. I had neural therapy on my neck, where they take your carotid artery, and they move it over to the side, and they freeze the nerves near the back of your neck for a quick second. It’s alternative medicine—the idea behind it is like starting a computer. Your nervous system, it’s the same way—if it feels the same way all the time, what do you need to get out of it? Sometimes, it needs to reboot. (Neural therapy is) actually just procaine and water. They put it in there, and it freezes it for a bit, and restarts like a computer and you hope it gets the bugs out. A lot of times, the pain and pressure you feel in your head is nervous-system related. So I even tried that. It’s not fun, sitting on a table and having someone move your artery over, and shoving that needle in there. You’re 100 percent awake. It’s alternative medicine, but you’ll try anything when you’re in that much pain and you don’t feel normal. So, that’s what I try to explain to people, that it’s something to be taken serious. That’s why I talk about it, and that’s why I have all the time in the world for people like you who want to write about it. I feel like that’s my obligation after what I went through—to, like I said, protect my peers. It gave me a whole new appreciation for people who go through life-threatening diseases and stuff like that—what they go through physically and emotionally. It allows you to appreciate life a lot more when you feel good. Your brain’s your computer, right? You tell it to write a story, it writes a story. You tell it to move a hockey puck, it moves a hockey puck. You tell it to do whatever you want, it will do whatever you want. When that ability gets taken away from you, it’s pretty darn scary. You don’t have the ability to tell it to do something, because it’s overheating, it’s overloading. A concussion like that, of that magnitude, it’s almost like you’re autistic, on the higher end of the spectrum—the autistic kids, when they hear loud noises and stuff, it overloads them, right? It’s too much for them. That’s what a concussion is like. Too much bright lights, noises and stuff, it shuts you down. You can’t do anything. So you’ve got to go chill. You’ve got to go sit in a room, no TV, no reading. You can’t read. It overloads it. It’s like too many programs running on your computer, the computer slows down. You’ve got a bug, can’t run those programs. The brain is the same way. You get hit and have a brain injury, it’s basically a bug. It slows you down, and it’s not better until it gets better. To reply to your observation, Dr Mulder about,..’ we don’t know what a concussion is’ let’s take the words from concussed Willie Mitchell to heart. Before I start I want to also say since you are a surgeon you have been so busy with just the horrendous work load plus the public visits like the other Brain Awareness night, how would you have the time to dwell on, ‘ what is a concussion?’ The answer to perhaps help guide you will come from researchers such as our little group in the same city that you protect who are truly passionate about the biology that is different following a concussion. I will speak not in certainty but in the intuitive language coached in doubt but nevertheless following the path of the changes in the brain that are revealing themselves to us. We are first and foremost seeking zones of vulnerability within the brain structure, within the anatomy to begin to outline where does the concussion reveal itself as a measurable point of reference? The similarities of a seriously concussed brain are pointing to an autistic brain that acts as if it were in zero gravity yet hasn’t left the influence of gravity on Earth. What does this last sentence imply? Autistic children have flawed social interactions. The positioning of their eyes when viewing the face has shown these children to dwell more on the mouth rather than the eyes. That is the reason I chose the drawing above with the disjointed eyes detached as well as the mouth detached from the face. 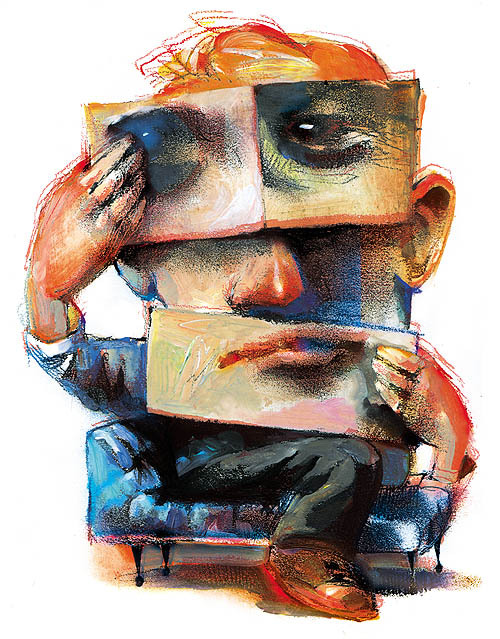 Our faces are our souls so if the constant messaging is inappropriately centered away from the eyes, perhaps the eyes themselves are not coordinated in the dimension of attentional concern. It may not be the focusing that is in error it may be on the positioning of the eyes themselves that is involved. The very latest observations of Dr. Jamshid Ghajar, President of the Brain Trauma Foundation, New York City are pointing along those lines. His documented analysis of visual specific disturbances following brain concussion in the form of eye saccades that uses eye positioning with infra red scanning show error excursions within only the vertical dimensions of eye pursuits. Horizontal eye motions are not in error but vertical eye positioning is in error. The autistic child may automatically prefer the horizontal mouth over the vertical eye above the mouth, that’s one perspective. But the more significant observation is that autistic children indeed do have errors in performing vertical eye movements. This is the beginning of why I find Willie Mitchell’s descriptions so compelling. He appears to be saying as he received more concussions his eye moving ability deteriorated to the point that all the ‘stimulus’ as he termed it was like being in an autistic space with just too much stimulus happening. He wanted to shut down the world around him to isolate himself from the noise and light. But the singular essence of this observation is reported from within the perturbed vestibular system to smoothly track a visual vertical direction. 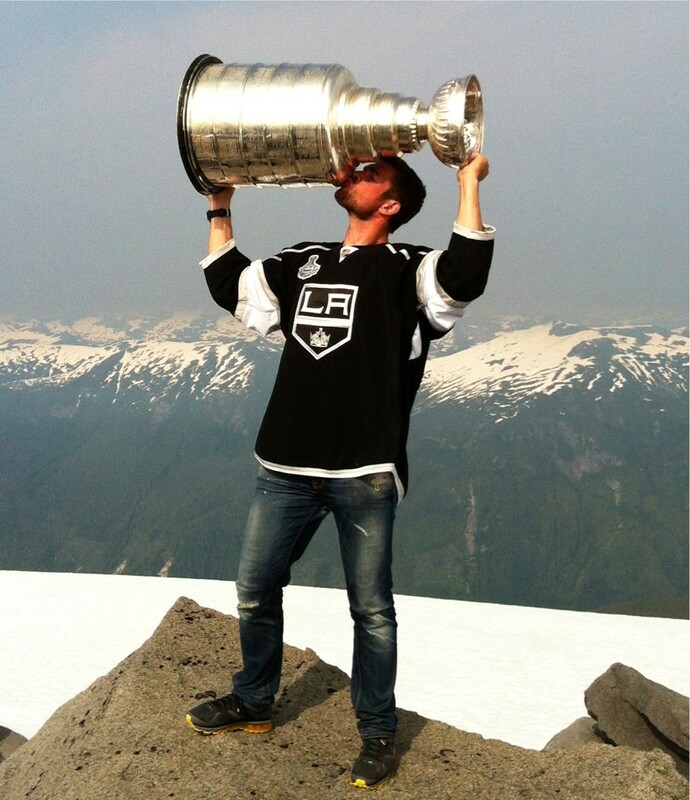 If Willie Mitchell’s multiple concussions are a vestibular injury, a swing into the visual balance aspect of his interaction with the world, his words are revealing intimately the vulnerable zones within his brain to coordinate such vertical eye positioning errors. This is the start of looking at the overlap of repeat concussion syndrome with autism changes within the brain axis, let’s investigate some more. In the Bone Density in Peripubertal Boys with Autism Spectrum Disorders journal J Autism Dev Disord. 2012 Nov 4 the authors Neumeyer AM, Gates A, Ferrone C, Lee H, and Misra M wrote in the abstract, ” We determined whether bone mineral density (BMD) is lower in boys with autism spectrum disorders (ASD) than controls, and also assessed variables that may affect BMD in ASD. BMD was measured using dual energy X-ray absorptiometry (DXA) in 18 boys with ASD and 19 controls 8-14 years old. Boys with ASD had lower BMD Z-scores at the spine, hip and femoral neck, and differences at the hip and femoral neck persisted after controlling for maturity and BMI. Vitamin D intake from food and in serum were lower in ASD subjects, as was exercise activity. We conclude that BMD is lower in peripubertal boys with ASD and may be associated with impaired vitamin D status and lower exercise activity.” Surprisingly this is the same kind of summation about either vitamin D and exercise language from NASA reports concerning astronauts despite very demanding bone loading during exercise protocols during space missions with vitamin D supplementation. Could it be that autism spectrum is also mimicking the bone loss that accompanies long terms missions in zero gravity aboard various space flights? Is it possible, like I have suggested earlier, that autism spectrum is like a physiological microgravity effect on central bone metabolism, by reducing bone density? Where might such bone loss be originating, what are the brain signals that might push this effect? So you see Dr Mulder there is big hope that we will better understand brain concussions. We are learning that the sense of gravity is one of the most important senses within our brain networks. There appears to be a overlap that autism is teaching us that as the brain is concussed the visual/balance system is injured which affects the perception through the visual system of our world within our balance of the world literally how the horizon appears for us in our sense of the 3 dimensional shape that we are interacting with in the earth’s gravity vector. The effects are also spread into our bones as if we are drifting away from gravity as if we are on a space ship above Earth. Magically Dr Mulder, getting a brain concussion is like being in outer space in terms of how our physiology reacts both within our vision within our sense of balance within our very bones. Getting a brain concussion Dr Mulder, is like we lose our sense of gravity within our brain’s signalling systems, that’s what we are starting to learn in this city that has overcome tragedies.